The House Republican leadership took a gamble. Prompted by outgoing Speaker Paul Ryan, it bet that that it could push through a farm bill without any Democratic votes by emphasizing work requirements in the Supplemental Nutrition Assistance Program (SNAP) aimed at cutting overall program spending. Stricter work rules are popular with most (but not all) Republicans but opposed by most (but not all) Democrats. Ryan bet that getting tougher on SNAP would overcome skepticism among more libertarian “Freedom Caucus” Republicans regarding the costs of commodity programs. And Ryan had at least the Twitter support of President Trump. That bet failed. The House on May 18 voted down HR 2, the Agriculture and Nutrition Act of 2018, 198-213, with 30 Republicans joining 183 Democrats in opposition. Freedom Caucus Republicans, many upset about inaction on a separate immigration bill, rebuffed Ryan’s overtures – as did a few of their more moderate GOP colleagues, for whom charges that their party was stigmatizing hungry people could prove unpopular going into the 2018 midterms. Prospects for House action by November are modest. Meanwhile, the Senate Agriculture Committee will move on its own, more bipartisan bill, to give senators at least symbolic benefits going into the elections. The take-away? 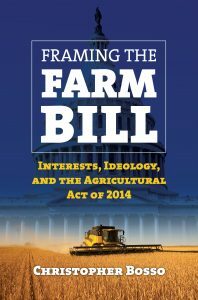 As we saw with the long saga over passage of the Agricultural Act of 2014, as detailed in Framing the Farm Bill, today’s House is a non-rural body. Only three dozen House members now represent “farming” districts. As such, the 1.7% of Americans who farm — and who depend on USDA farm programs – need the votes of colleagues for whom agricultural policy is a distant priority. To do so, they extended farm bills to include priorities of those colleagues — nutrition programs. Their political calculation was clear. Since the 1970s a shrinking congressional farm bloc included nutrition programs, SNAP in particular, into farm bills precisely to get the votes of their non-rural colleagues for commodity programs they might otherwise oppose as “welfare” for ever-larger farming operations. In return, rural conservatives would support nutrition program spending despite their antipathy toward “welfare” for poor people. That “farm programs + food stamps” deal, an awkward marriage of convenience at the best of times, became the linchpin holding together the farm bill coalition. However, the House GOP’s most conservative members, bolstered by their homogenous suburban base, rejects this deal. They despise SNAP and commodity programs. In 2013, after dealing the Agriculture Committee a similar floor defeat, they split the two into separate bills, passing each by party line votes. The Senate, whose members represent broader constituencies, reknit the two. No SNAP, no Farm Bill. Ryan could put SNAP into a “welfare reform” bill. It won’t pass the Senate, because few senators want to untie the knot that has held together farm bills for decades. More to the point, it won’t pass because the few who farm depend on the good will of the non-farming majority for whom SNAP is important. The House GOP’s partisan farm bill had no hope. Christopher Bosso is professor of public policy and urban affairs at Northeastern University. His books include Environment, Inc.: From Grassroots to Beltway, also from Kansas, and Pesticides and Politics: The Life Cycle of a Public Issue.